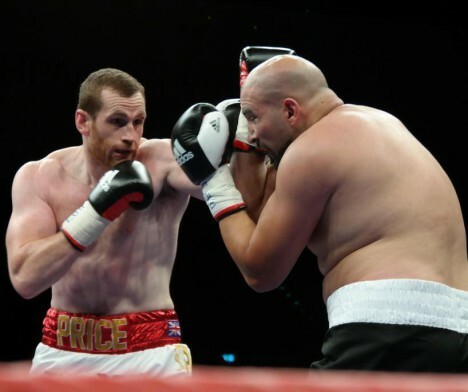 Former heavyweight contender David Price 22-5 (18) hasn’t ruled out the possibility of facing returning lineal heavyweight champion Tyson Fury 26-0 (19) in the autumn. Speaking to Sky Sports the 6-foot-8 Liverpudlian revealed his management team at MTK Global are planning a big fight for him once he gets past his next opponent in Bolton on July 27. With Fury and Price both now managed by MTK Global, it seems the possibility of a big domestic clash between the two is closer than ever. Fury, who at 6-foot-9 is one inch taller than Price, returned to the ring after a lengthy absence with a fourth round stoppage of blown-up Albanian cruiserweight Sefer Seferi last month. He is due to appear on the undercard of Carl Frampton’s WBO interim featherweight title defence against Luke Jackson at Belfast’s Windsor Park next month. Price, a former British and Commonwealth champion at heavyweight, says he has had preliminary discussions with Fury about the fight. “Whether or not it’s something Tyson Fury would be interested in is another story, because you’ve got to look at the risk-reward factor for Tyson Fury, which I’ve spoken to him about anyway,” Price said. “For him to fight me, I’ve lost five times, would he get any credit for beating me? Probably not and there’s the chance that I could knock him out, there is that chance, although that’s probably how he feels, there is always the fact that I think a lot of people would still like to see the fight. “It’s probably more interesting now than any other time, because of the circumstances that he’s coming back after a long layoff. The 34-year-old Price was stopped in five rounds by leading contender Alexander Povetkin 33-1 (24) in his last fight in March, but not before causing the Russian veteran trouble in the early rounds.